Looming Demolition of Centre Artisanal? The 1962 Centre Artisanal in Sèvres, designed by the office of Candilis Josic Woods, is under threat of demolition. The project is an early example of French structuralism and what Alison Smithson called 'mat-building'. The arts building with studio spaces is a precursor to the more famous projects for the city centre of Frankfurt am Main and the Berlin Free University, which was realized in the early 1970s. Pierre Lagard, architect in Sèvres has started an action to prevent demolition. Alexis Josic is involved, too, and willing to advise on a possible restructuring of the project. After all, Candilis Josic Woods designed the building in such an elementary way to facilitate re-appropriation by future users. To help save the building from demolition, please sign up with Pierre Lagard. For more information check the website Désirs d'avenir. CIAM 9 d'Aix-en-Provence, 1953. The book is the result of a colloquium organised in 2003 by Jean Lucien Bonillo, Claude Massu and Daniel Pinson. 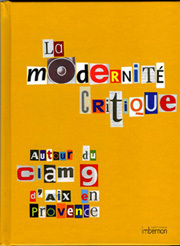 'La Modernité critique' presents a broad reflection on the event of the ninth CIAM congress, including the issue of habitat, and the formation of Team 10. Of particular interest are two interviews with Blanche Lemco-Van Ginkel, who was involved with Team 10 in its early years, and Gérard Thurnauer, member of the Paris CIAM group, and co-founder of the firm Atelier Montrouge. The book also contains various reflections on positions close to, or parallel of the CIAM discourse and the Team 10 group, such as Roland Simounet, John Habraken, Josep Lluis Sert, and Ernesto Rogers. For more information visit the publisher's website: Editions Imbernon. 18 September, 18.30, Ken Frampton will deliver a lecture 'Structure, Identity and Existence in the Work of Team 10'. 21 September, 18.30, a short symposium will take place; invited participants include Tom Avermaete, Peter de Bretteville, Keith Krumwiede, Ana Miljacki and Alan Plattus. For more information contact the Yale School of Architecture. 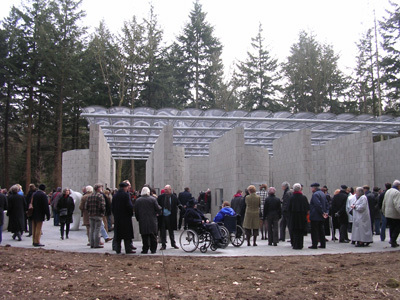 On 21 March 2006 the reconstructed sculpture pavilion of Aldo van Eyck was opened at the Kröller-Müller Museum in Otterlo. This provisional, yet poetic structure was originally designed for the 1966 sculpture exhibition at Park Sonsbeek, Arnhem. It was dismantled after the exhibition was closed, and gained an immediate cult status. Now, after years of preparations and fund raising the pavilion can be visited again. For the occasion the museum set up a modest and elegant presentation of drawings for the pavilion, including hitherto unknown sketches from the Van Eyck archive. It could be visited until 11 June. 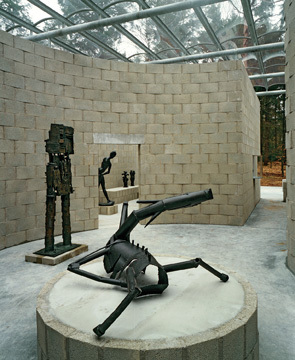 During the winter of 2005-2006 the Kröller-Müller Museum’s Sculpture Garden has witnessed the reconstruction of the pavilion that Aldo van Eyck designed in 1965 for the 5th International Sculpture Exhibition, which was held at Park Sonsbeek in Arnhem from 27 May to 25 September 1966. This temporary pavilion was dismantled after the exhibition. Despite having existed for a mere few months, reactions to the pavilion were extremely positive, from both the general public and art and architecture enthusiasts alike. The pavilion has gone down as a highpoint in Dutch architectural history and is viewed as one of Van Eyck’s masterpieces. The Van Eyck pavilion is compact and closed, making it ideal for displaying small pieces of sculpture, which are richly represented in the museum’s collection. Thanks to its intimacy and its contrast with the surrounding landscape it has an entirely different spatial effect and functionality to the pavilion that Gerrit Rietveld designed in 1955 for Park Sonsbeek and which has stood in the Kröller-Müller Museum’s Sculpture Garden since 1965. The Rietveld pavilion’s elementary and open character and its connection with the landscape makes it better suited to displaying large sculptures and projects. These considerations, combined with the design’s great architectural value have been crucial in the decision to reconstruct this second pavilion in the garden. The reconstruction of the pavilion was discussed with Aldo van Eyck before his death. He made the necessary alterations to the design to unsure a longer lifespan than its original few months. These changes, mainly affecting the roof, have been implemented by the architect’s widow Hannie van Eyck and Abel Blom from Buro Van Eyck. 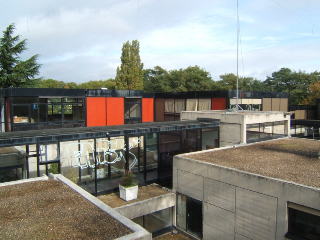 For more information on the Kröller-Müller Museum visit their website. 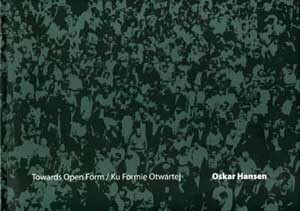 Towards Open Form by Oskar Hansen is posthumously published by the Foksal Gallery Foundation in collaboration with the Warsaw Academy of Fine Arts Museum. 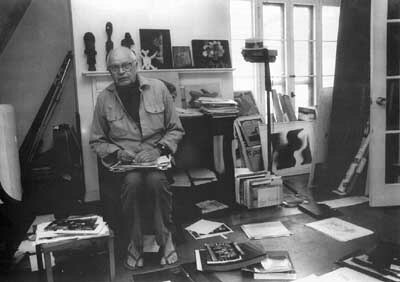 The English-Polish publication is edited by Jola Gola who also authored the monograph of Jerzy Soltan of 1995. This book is the first full-scale pesentation of Oskar Hansen's Open Form and at the same time a monograph of his work. It is made up of two parts - a presentation of the different fields of Hansen's work, selected and arranged by the author himself, and a chronology showing events in his life and work on a temporal axis. For the author, the book's visual design has become one of the ways of presenting his Open Form idea: the contents 'flow' before the reader's eyes, taking them from one topic to another. The non-textual introduction is an iteration from the Polish catalogue for the 1960 Milan Triennal. 'Bridging' the book's two parts are interviews with the artist: Joanna Mytkowska's in the first part, and fragments of Hans Ulrich Obrist's in the second. The book can be ordered on-line from Revolver, Archiv für aktuelle Kunst. On 16 September 2005 Jerzy Soltan died in Cambridge, Massachusetts. Another Modern by Tom Avermaete focuses on the theory and practice of the French contributors to Team 10: Georges Candilis, Alexis Josic and Shadrach Woods (all disciples of Le Corbusier). Relying for the first time on the archives of both Georges Candilis and Shadrach Woods, it re-situates the work of the Candilis-Josic-Woods partnership (1952 - 1970) within the international framework of CIAM as well as within the French context of decolonization and modernization during les trente glorieuses (the 'thirty glorious years' between 1945 and 1975). 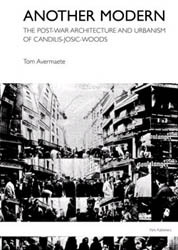 The author argues that the work of Candilis-Josic-Woods entails a new way of analysing, understanding and conceiving the built environment, an approach that is radically different to those previously propagated within CIAM. Avermaete reveals how this new approach to the built environment was elaborated in architectural and urban projects for three realms that changed drastically during the post-war period: residential culture, urban culture and mass leisure culture. This book addresses the projects and ideas of Candilis-Josic-Woods as a relentless quest for an inclusive design approach that acknowledges both the complexity of social life and its spatial translation. The opening of this exhibition coincides with the launch of this website and with the book Team 10, 1953-1981, In Search of a Utopia of the Present, published by NAi Publishers. The exhibition, which has been organized in association with the Faculty of Architecture at the TU Delft, emphasizes the work of Team 10's core group: Alison and Peter Smithson from England, Aldo van Eyck and Jaap Bakema from the Netherlands, Giancarlo De Carlo from Italy and Georges Candilis and Shadrach Woods from France. This first major survey of Team 10's work draws upon material from collections around the world, including the Centre Pompidou, the Harvard University, the Università di Venezia, the ETH Zurich and the Fondation Le Corbusier, as well as private collections. The exhibition "Team 10 - A Utopia of the Present" is on show at the NAi from September 25, 2005 until January 8, 2006. After this, the exhibition goes on tour to Milan, IFA Paris and Columbia University in New York. See the NAi website for location and opening hours. To See the World , an exhibition at Zach�ta National Gallery of Art, accompanied by a publication bearing the same title, presents the last project the artist completed before his death on 11th May 2005. Fragments of paintings will be arranged in front of the main entrance to the gallery displaying time-space relationships. Above them, a structure of roadblock spikes will appear to frame the sky and integrate the exterior with the interior, attracting viewers inside. The structure is a reference to the artist s first solo exhibition in the Salon Po Prostu at the Jewish Theatre in Warsaw (1957). In the following rooms will be presented paintings by Hansen that have not been on public display since that first exhibition. Another room will be filled with a different structure for organising space  a rounded shape primarily intended as a background for a visitor and (in keeping with the artist s original wish) for Hansen s students, who will present their works here during the exhibition. The exhibition will also feature some of the apparatuses constructed by the artist, i.e. the devices that students formerly used to complete exercises in his classes. With its space-integrating structures and densely displayed paintings, the exhibition leads up to a large, empty space with a single armchair in the middle and two clocks ticking out of sync on two opposing walls. When making drafts for the exhibition the artist was already aware of his fast-approaching death, and the last room is intended to provoke reflection on the passage of time. 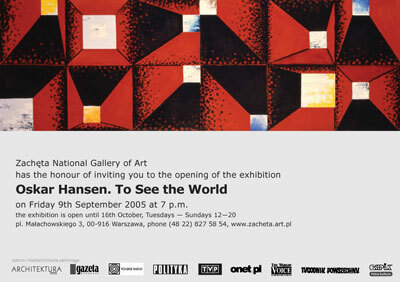 The exhibition and the publication have been prepared in cooperation with the Museum of the Academy of the Fine Arts in Warsaw that houses Oskar Hansen s collection. NEW YORK, August 1, 2005) The archive of the New York architect, urban planner, teacher and theorist Shadrach Woods (1923 1973) has been donated to Columbia University s Avery Architectural and Fine Arts Library. I am tremendously excited that this material has come to Columbia just as the critical reevaluation of Woods and his contemporaries is getting underway said Mark Wigley, Dean of the Graduate School of Architecture, Planning and Preservation. Beginning his career in the office of Le Corbusier, Woods subsequently designed innovative housing in Morocco and Algeria with Georges Candilis, forming a partnership with the latter and Alexis Josic in 1954 in Paris. Their early projects inspired the formation of the Team 10 group and helped set the agenda for postwar modernist architects. As Candilis-Josic-Woods the firm won and executed several important commissions in France and elsewhere, most notably the new master town plan for Toulouse-le-Mirail (1961) and a plan for the Free University of Berlin (1963). Woods also lectured various universities including Cornell and Yale and from 1969 he was a professor at Harvard University s Graduate School of Design. His writings include Urbanism is Everybody s Business (with Joachim Pfeufer, 1968), What U Can Do (1970) and The Man in the Street: a Polemic on Urbanism (1975). With his death a generation falters, stated the obituary for Woods in Architectural Design, written by fellow Team 10 member Peter Smithson. The archive, currently still being processed, is the gift of Val Woods. An oral history component and a program of research and exhibition are in development. Further relevant material is being actively sought from Shadrach Woods  former friends and colleagues. A public event celebrating the arrival of the archive is scheduled for Monday, November 14, 2005 in Columbia s Avery Building. Gabriel Feld, Professor of Architecture at the Rhode Island School of Design, will lead a discussion of Shadrach Woods and the importance of his work. The event will also feature a viewing of the Woods Collection. The Avery Architectural and Fine Arts Library is one of the most outstanding and comprehensive collections relating to architecture and the fine arts in the world. Avery collects a full range of primary and secondary sources for the advanced study of architecture, historic preservation, art history, decorative arts, city planning, real estate, and archeology. The Library contains more than 400,000 volumes, including 35,000 rare books, and receives approximately 1,000 periodicals. Avery s Drawings and Archives collection includes one million architectural drawings and records. The Library is home to the Avery Index to Architectural Periodicals, an operating program of the Getty Research Institute, which is the only comprehensive American guide to the current literature of architecture and design. Columbia University Libraries is one of the top ten academic library systems in the nation, with 8.6 million volumes, over 65,650 serials, as well as extensive collections of electronic resources, manuscripts, rare books, microforms, and other nonprint formats. The collections and services are organized into 22 libraries, supporting specific academic or professional disciplines. Columbia Libraries employs more than 400 professional and support staff to assist faculty, students, and researchers in their academic endeavors.